Making Christmas Bright is a new stamp set that is featured in Stampin’ Up’s 2018 Holiday Catalog. The stamp set is photopolymer and has 17 stamps to create with. Imagine the possibilities. 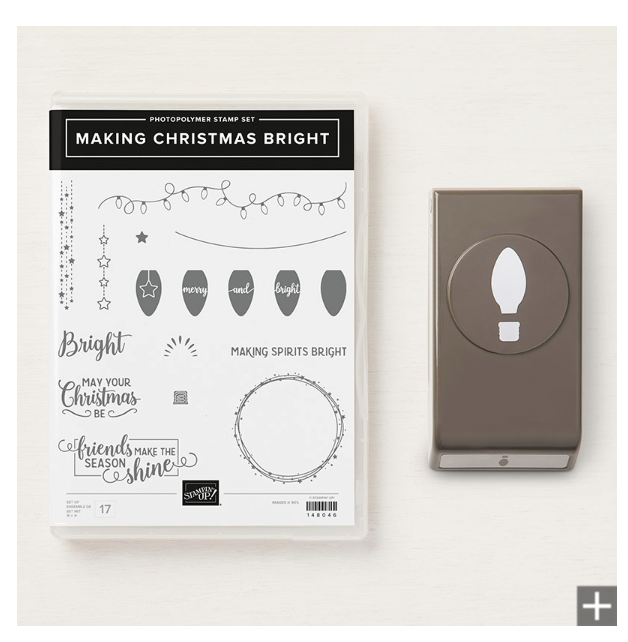 The stamp set coordinates with the Christmas Bulb Builder Punch. When purchased as a bundle, you save 10%. I heat embossed the image with Silver Embossing Powder and used our Stampin’ Blends to color in some of the bulbs. The subtle touch of Silver Metallic Thread adds just enough to give the card the “stepped up” factor. A card is never complete until the inside is stamped and decorated. If you would like to make a few of these this holiday season, here are the products you will need. Sleigh Ride and Jingle All the Way!! I bought this set during the pre-order this summer and I am so sorry that I didn’t use it sooner. It is perfect for elegant cards and just my style!!! The framelits and coordinating stamp set will be retiring at the end of this year. If you would like to create this card, please make sure you place your order for these items before they are no longer available. Yesterday I held my very first Boo Bingo. It was a great success. We made two make and takes, raffled off prizes, played six games of bingo with fabulous prizes, ate delicious treats and visited with friends. Thanks to my friend, Lisa for the great idea!!! Debbis Vassas was the Jackpot winner. She won the coverall game which was $125 of Stampin Up products of her choice. The next Bingo is January 2, 2016. I only have 6 spots left. Let me know if you want one of them. I recently held a Christmas Stamp a Stack Class and this was one of the cards we made. I stamped the image on Shimmery White card stock with Versa Mark ink and sprinkled with silver embossing powder. I colored in some of the image with Wild Wasabi ink and the Aqua Painters. I hope you really like this card as much as I do. In case you missed my Facebook post a few days ago, here is another card I posted on FB. We made this at my Breakfast Club classes this past week.